Grace & Glory Training & Consulting Institute is creating thousands of new jobs and many enterprises. Our training is practical and focused on making people work ready! With at least one computer per trainee and reliable networked internet access. Grace & Glory Training & Consulting Institute facilities together with enthusiastic and passionate professional trainers push everyone beyond their potential. 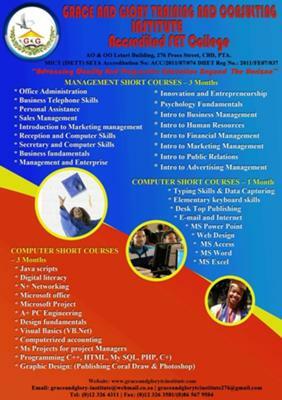 Enrollment on our courses run through the year. Trainers are well-qualified professionals and we make sure trainees have the right resources. Graduates go on to start their own businesses, to work in one of the growing number of companies.